People around the world have been grown environment conscious. In fact, there’s no other way we can go if we have to protect ourselves from destruction. What better route can we take? Ajmer Sandhu shows us just this through his organization ‘ TellusArt’, a NGO based in Sweden. “Our organization comprises of art enthusiast from around the world. We believe that the power of art can be effectively harnessed into creating awareness about pressing issues the world faces today especially as regards to the environment”. Explains Ajmer, who is a trained artist now involved In social work, whilst running a successful business in Sweden. 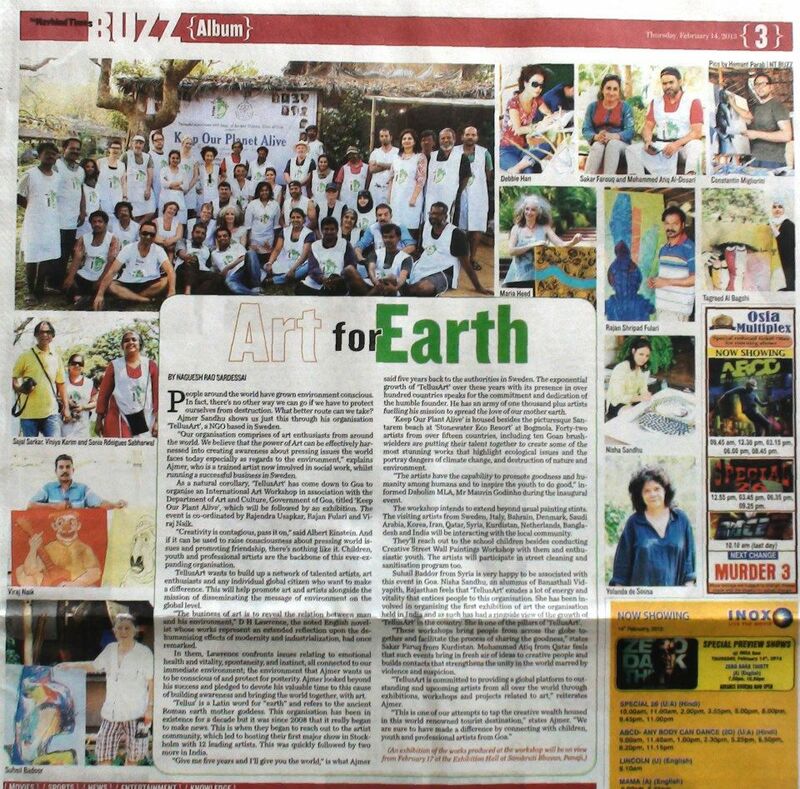 As a natural corollary, “TellusArt” has come down to Goa to organise an international art workshop in association with the Department ao Art and Culture, Government of goa, titled ‘Keep Our Planet Alive’, which will be followed by an exhibition. The event is co-ordinated by Rajendra Usapkar, Rajan Fulari and Viraj Naik. Artist have the capability to promote goodness. The Dabolim MLA, Mr Mauvin Godinho on Thursday said that artists have a capability to promote goodness and humanity among humans and to inspire the youth to do good. He was addressing as the chief guest at the ‘Keep Our Planet Alive’ art workshop and exhibition, organised by TellusArt , Sweden in association with the department of art and culture, at an eco resort, in Satarem beach in Issorcim. 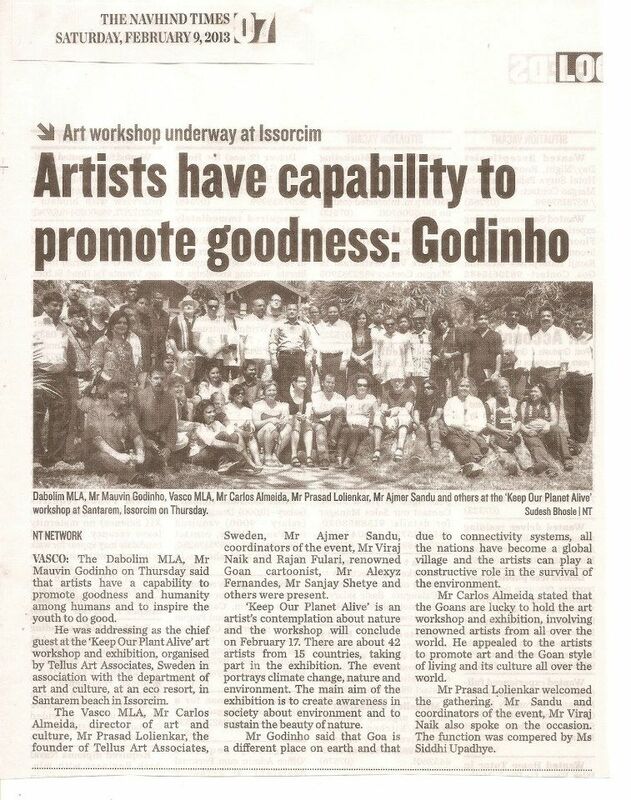 The Vasco MLA, Mr Carlos Almeida, director of art and culture, Mr Prasad Lolienkar, the founder of TellusArt, Sweden, Mr Ajmer Sandhu, coordinators of the event, Mr Viraj Naik and Rajan Fulari, renowned Goan cartoonist, Mr Alexyz Fernandes, Mr Sanjay Shetye and others were present. ‘ Keep Our Planet Alive’ is an artist’s contemplation about nature and the workshop will be concluded on February 17. There are about 42 artists from 25 countries, taking part in exhibition. The event portrays climate change, nature and environment. The main aim of the exhibition is to create awareness in society about environment and to sustain the beauty of nature. The purpose of art is washing the dust of daily life off our souls. Do not go where the path may lead, go instead where there is no path.